Okay, so you have a large space you need to fill with some art, but you don’t want to drop over $100. I have a solution that I have been using. Keep in mind, you cannot sell this art, it is illegal, but I use it in my own home. I am going to literally walk you through step by step, so bear with me, but this will save you TONS of money. This can be used for large scale art, or really any size art that you want to print. I am not condoning printing art that is not your own, but I am going to teach you how to print something using my free printable art where the copyright has expired. 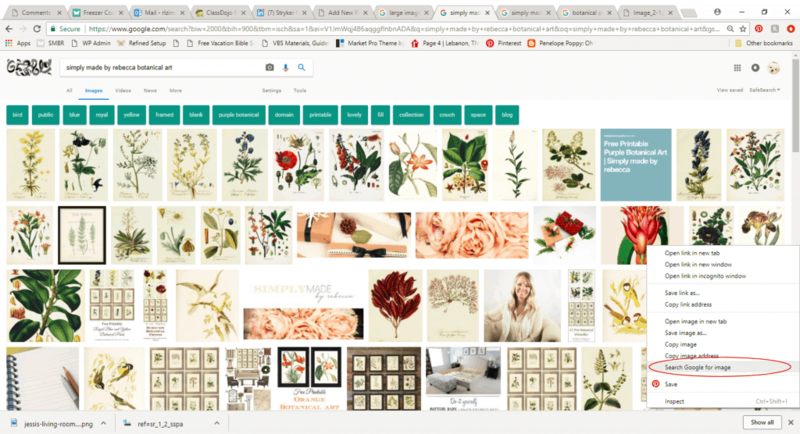 You are on Google and you come across art that you want to print. 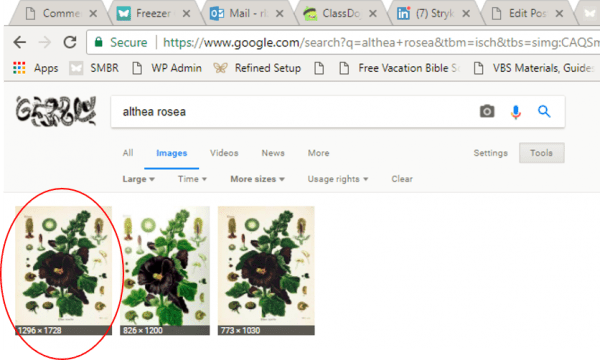 I have personally searched for Free Printable Botanical Art and found images that I would like to print (they are from my blog). Put your cursor over the image that you like and right click. 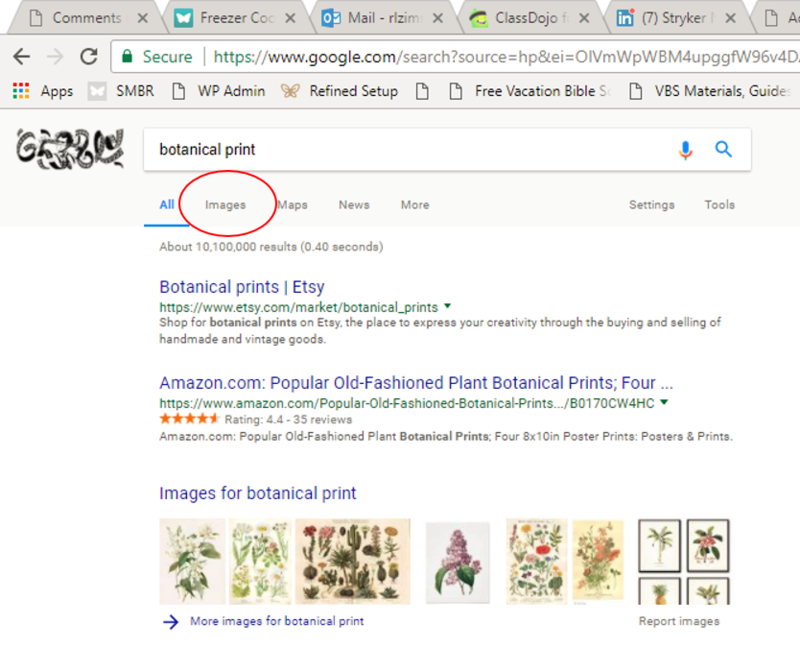 Then select the Search Google for Image option in drop-down menu (circled in red). The next screen that comes up is shown below. 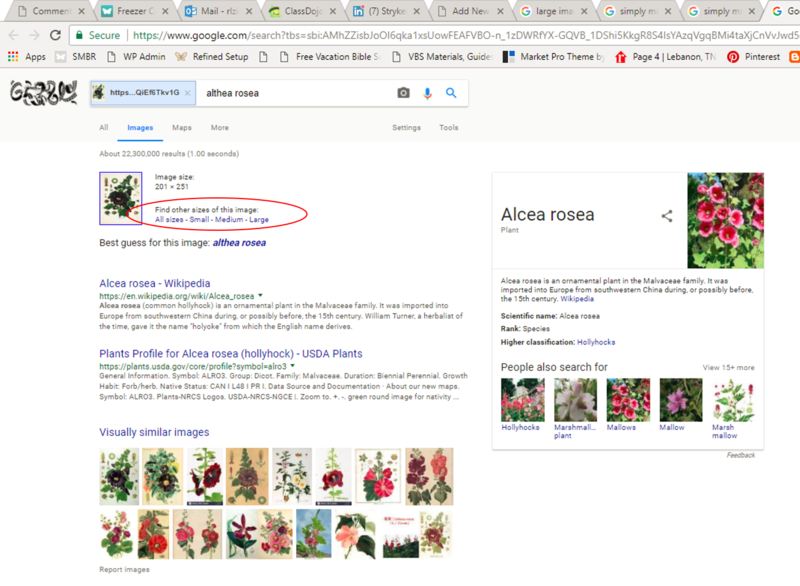 It shows the image size for the image you selected, and if you look below it says “Find other sizes of this image:”. 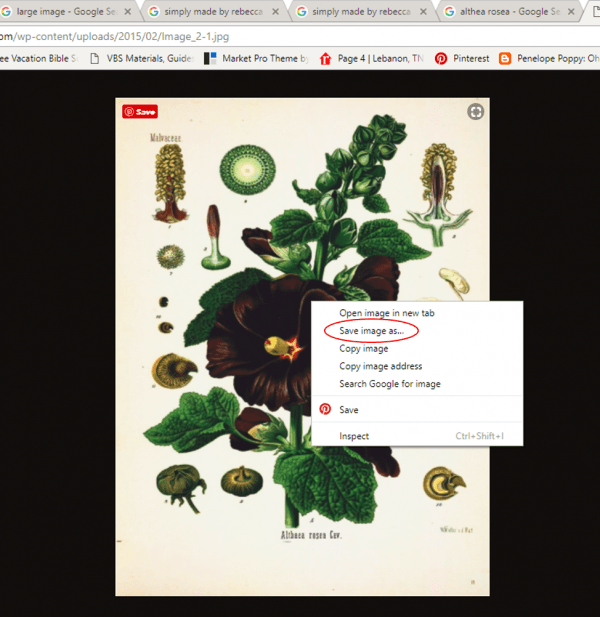 To print an image large scale, you want this to have an option that says Large. If it does not, you want to keep looking for another image that does have a large option available. Below I have a circled the area I’m referring to in red. If you enlarge a small image and print it, you will just get a blurry image. Click on the Large option. It will take you to another screen. Click on the image with the largest file size. For example, the file size of the image that I will click on is 1296 x 1728 (circled in red). After you have clicked on it, it will take you to the screen pictured below. On this screen you will click View Image (circled in red). Okay, you now have a large scale image saved to your computer. The next step is to get it formatted for printing. 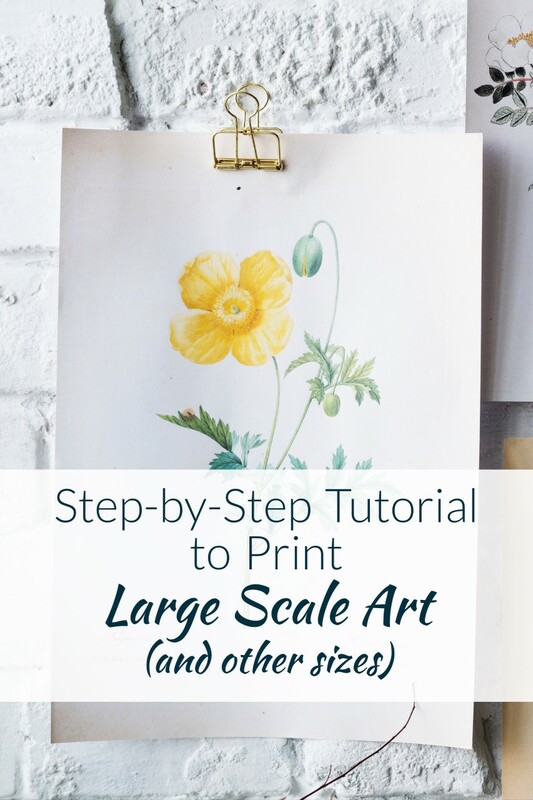 If you do not care about the size of your print, you can skip to sending the file to print, but if you would like to frame your printed art in a standard sized picture frame you want to follow this next part. Just to add, I have a whole section on my blog called Free Printable Art that is contains art already sized for standard picture frames. Click on my Free Printable Art tab above to find ready-to-print art. Decide what size you would like your art. Standard frame sizes are 8×10, 11×14, 16×20, 18×24, and 24×36. 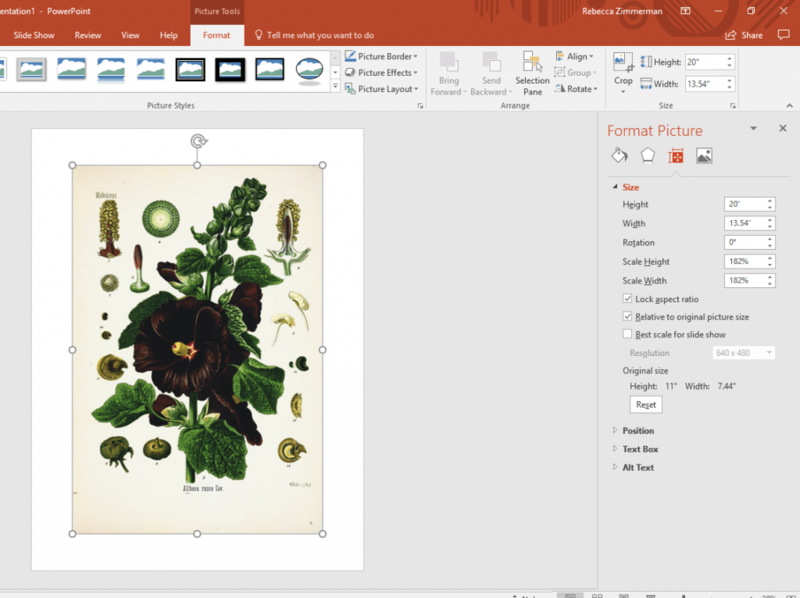 Open Microsoft Powerpoint. 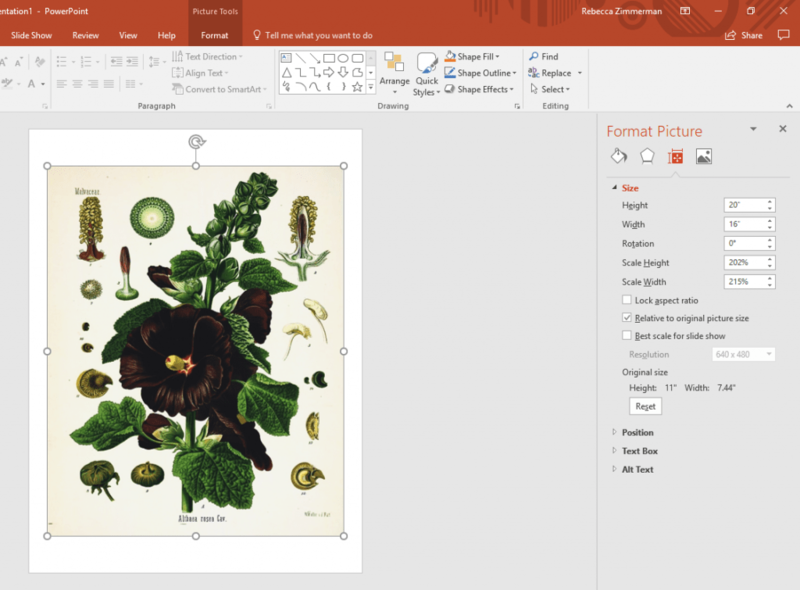 I use Powerpoint because more people have access to it and I find it easy to use. I know there are many other programs that could be used to do this, and I do use other programs, but Powerpoint is probably more easily accessible than some of the others. You will first need to set the size of your slide. To set the size of your slide you will first click on the Design Tab. Then click on the Slide Size Tab (pictured below). A drop down menu will appear. Click on the Custom Slide Size option. The slide size will correspond with the size of paper you will be printing on. The size of paper will be determined by what size you would like to print your art. I have made a table below that shows you how to decide what to set your slide size to. The Slide Size box will appear. You will use the Width and Height boxes to set the slide size. What is an engineering print? An engineering print is also called a blueprint. The paper is thin, but the print quality is good and you can print 24″ x 36″ art for a few bucks. I have done it often and I’m satisfied with the quality for the price. I’m obviously not an art collector. I am a DIYer who doesn’t want bare walls. There’s a big difference. Back to the tutorial. Remember, when you’re setting the size you need to consider whether your art is portrait or landscape. If it is portrait, put the larger number in the height box, if it is landscape, put the larger number in the width box. I am setting my slide size for a 16×20 inch portrait print. So, I set the height at 24″ and the width at 18″ because that is the paper size that is available at the printer that will fit a 16×20 inch print. The paper is Arch C Engineering print paper. Click on the Insert tab and then select Pictures. Find your file and Open it. Chances are, when your file comes in it won’t be the right size. 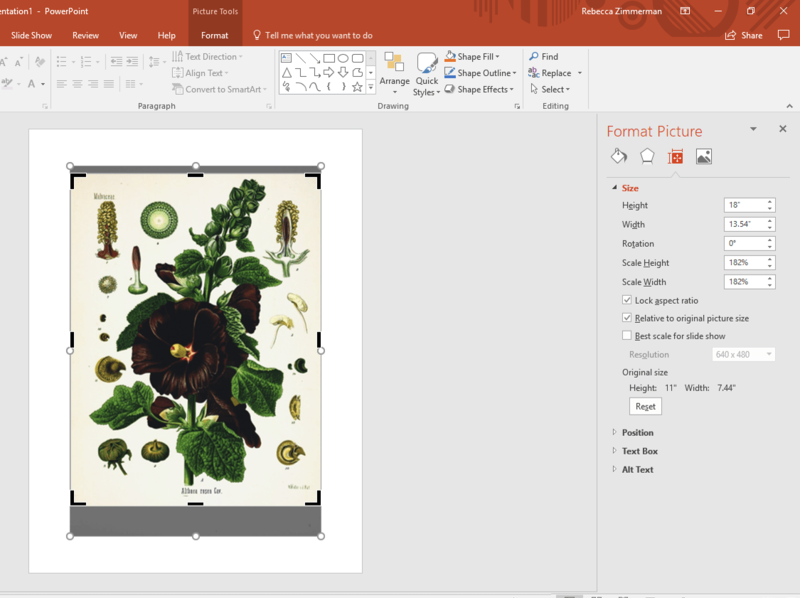 Your slide is now the size that your paper will be, but you need to resize your image to get it to the right size. For this example, I need to resize my image to be 16″ x 20″. Right click on your image and select Format Picture from the drop down menu. This should bring up the Format Picture Toolbar at the right side of your screen. Select the Size and Properties Icon. You are going to need to ensure your image is the height and width of the frame you’ve selected. I need 16″ x 20″. Now, if I just try to put 16″ in the width and 20″ in the height it will not work. I have the Lock aspect ratio box checked. What will happen is one dimension will stay, for instance 16″, but the 20″ may not be right because my original image has a different aspect ratio. If I uncheck the Lock aspect ratio box, then I can add my 16″ and 20″, but you will see that it might distort your image. This process involves a little bit of back and forth. You may be satisfied with the new image by only changing the size to what you need, but you likely will not be happy with the results. What I normally do is go back and forth between sizing the image, and then cropping some off the edges. I’ll show you below. I have unchecked the Lock aspect ratio box and changed the height of my picture to 20″, but you can see that the width is not correct. It is hard to see, but my width is 13.54″ not 16″. So, now I have two options. I can change the width to 16″ and call it a day. Let’s see what that does to my image (below). For this particular image, that is not so bad. I would probably be happy with this, but I can tell you that for many images stretching them 3″ will really distort the image. So another option is to crop the height or width of the picture to achieve a reasonable image. For these purposes, because my width is too short, I would want to crop my height, not my width. Let’s try that. 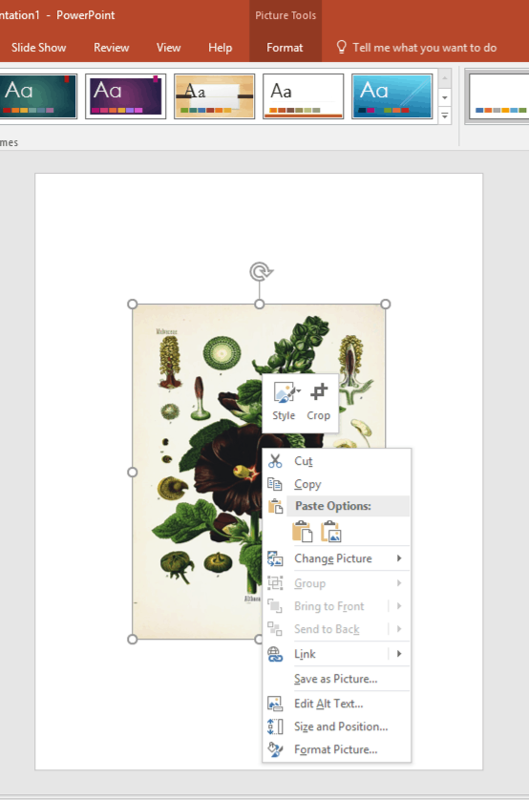 To crop an image right click on the image and select Crop from the drop down menu. These handles will appear around the image (pictured below). You set the crop area by clicking on the black handles and dragging them. Click off the image when you are finished. Pay attention as you do this to the height and width on the Format Picture toolbar. I have cropped my height down to 18″. I will need to again uncheck the Lock aspect ratio box, but now when I change my height to 20″ and my width to 16″ it will not distort my image as much (pictured below). 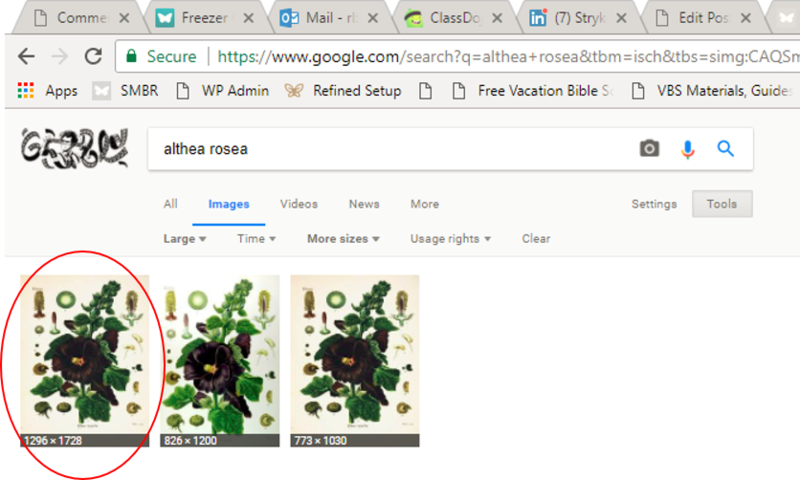 If you look at the original size of my image and the scale height in the Format Picture toolbar you will see that I have enlarged my image by 202%. To check that my image is not too pixelated I view it at 100%. To do this, click on the View tab at the top, then click on Zoom, and then select 100%. You will be able to see how pixelated the edges will be and how clear the image is. This is a subjective thing and you have to decide what you’re happy with. The last step is to save the Image as a pdf file. 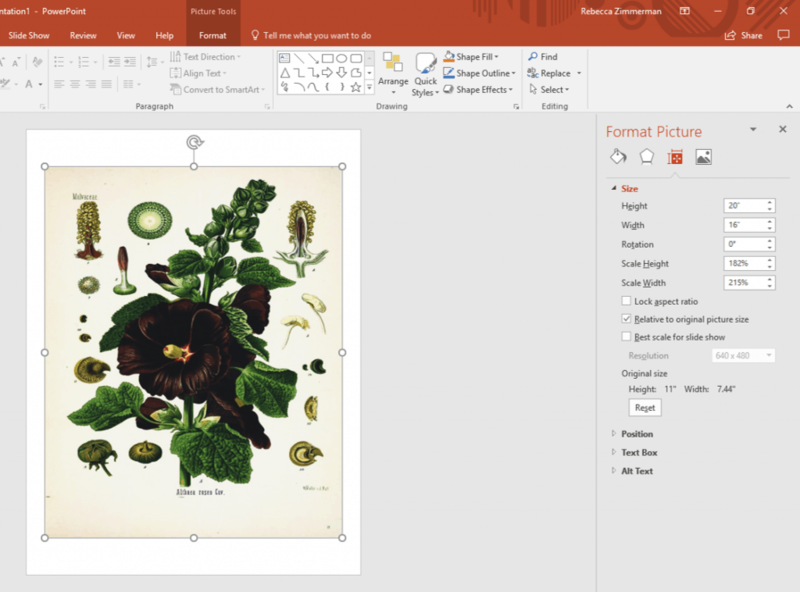 You can save it as a powerpoint file for later use, but the printing company you will be sending this image to will probably prefer to print from a pdf file. To do this select the File tab, and then Save As from the drop down menu. Select the folder you would like to save it in. 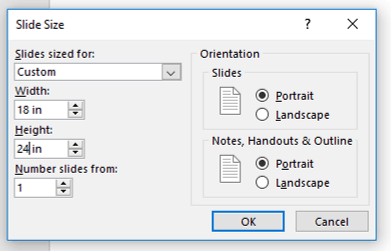 Click the drop down menu for file type and select PDF. Now, when you got to print this file, it will be sized appropriately for the printing companies different paper options. I use our local Office Depot to print and I upload it online, but you just need to find someone who will print engineering prints in your local area or have it printed through an online printing resource. You can also print these as posters, which is higher quality but costs more. The standard posters sizes are 18″x 24″ and 24″ x 36″ so you just need to follow the same process but use those sizes. I hope you enjoy your large scale art project!